Search for the best flight prices from Stansted Airport to Paris. Compare prices, book today and save money with Stansted Airport. There are no words that can summarise the French capital in its entirety, Paris is both steeped in history and firmly fixed on the cutting-edge of modernity. It’s both a bustling metropolis and a quiet escape from the likes of London or New York. The one thing that can be said about Paris is that it is one of the most romantic cities in the world, with a never-ending series of monuments to love and passion. Even if you’re not looking for the ultimate couple’s retreat, there’s still plenty to do in the city for families, backpackers and any other visitors with many of the largest museums in the world as well as the famous Louvre Museum and art gallery. Whatever you’re planning to do in the city, be sure to take some time to stray away from the centre and explore the lesser known areas of Paris as there’s plenty of hidden gems to be discovered. 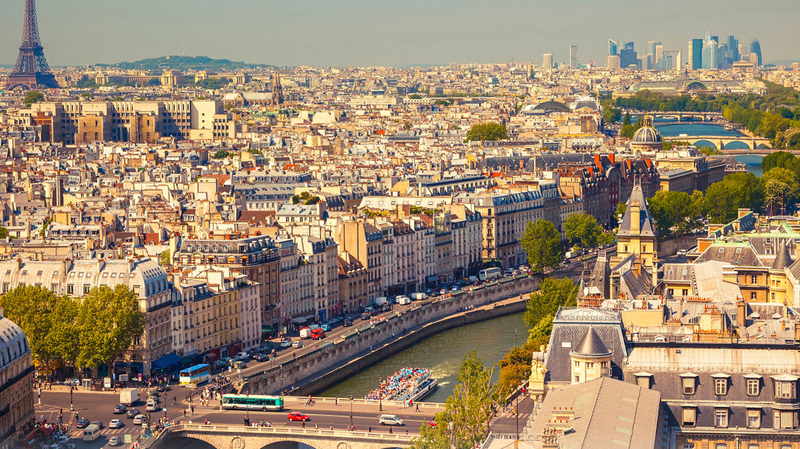 As the most visited tourist destination in the world, Paris plays host to visitors of every kind which is reflected in its dizzying range of hotels, hostels and boutique accommodation. If you really want an experience that will stay with you for a lifetime, the French capital’s legendary ‘palace hotels’ are still considered the crème de la crème, with the likes of Le Meurice offering a high-level of service at an equally high price. Other fantastic options include the modern luxury found at W Paris Opera and the Hotel 7 Eiffel which sits close to the iconic tower. Travellers on a budget may want to consider the three-star Hotel Langlois which has a fantastic location in the ninth arrondissement. Paris is certainly one of the shopping capitals of the world, rivalling New York or Tokyo. The first stop for shoppers is often the stores and fashion outlets of the Champs-Elysees, however, there is plenty of designer jewellery, catwalk boutiques and high-end hotels to be found on the nearby Avenue Montaigne. Elsewhere, there’s gourmet food and ingredients on sale at the city’s food emporiums, including La Grande Épicerie and the food department of Galeries LaFayette. Don’t miss the flea market at Marche aux Puces Saint Ouen de Clignancourt. Paris has more Michelin-star restaurants than any other city in Europe (over 80 at the last count) including 10 that boast the hallowed three-star status – so it’s fair to say that there’s plenty of delicious food to be had while visiting. If you want to sample the city’s best food then a visit to Alain Ducasse au Plaza Athénée is ideal, as the restaurant boasts a traditional finesse with a contemporary twist. Those who want something a little more down-to-earth will enjoy Bistrot Paul Bert, or the new-opening Terroir Parisien – run by celebrated chef Yannick Alléno. If you’re more in the mood for something quick try the street food in the Le Marais district. Paris Fashion Week takes place twice a year – once to showcase spring/summer collections, once to promote autumn/winter collections – and has become a staple in the world of glossy magazines and designer clothing. The events are usually a whirl of catwalk shows and parties. Every summer, temporary beaches are laid down across the banks of the Seine to provide some respite from the often-fierce heat giving the whole stretch of river is given a tropical makeover. This is a perfect time for families to visit as the beaches are free to visit and often feature beachside cafes, riverside games and even the odd palm tree!